Kamakshi Amman Temple is an ancient shrine dedicated to Goddess Kamakshi. 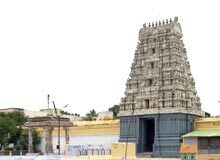 Located at Kanchipuram, the temple is easily accessible by regular buses and private taxis that are available throughout the state of Tamil Nadu. Former capital of the Pallavas, Kanchipuram lies at a distance of 75 kms from Chennai. Kamakshi Amman Temple is considered as one of the sacred abodes of Goddess Parvati, other being Meenakshi at Madurai, Akilandeswari at Thiruvanaikaval and Vishalakshi at Varanasi.